The strange Oriental intro and conclusion … and then another really attractive tune, even though it’s a basher of a kind. The intricate bass riffs come through strongly tonight … a purpose-designed hall. The playout, following the drum statement … arguably the most stirring music of the whole evening. Like the previous song this was absolutely beautifully lit, with warm autumnal tones. The build-up also very stirring. A smashing performance. GB refers to the venue, at Greve, saying it’s pronounced ‘Grave’ in Procol language. ‘What commandment do businessmen break? They lark about!’. 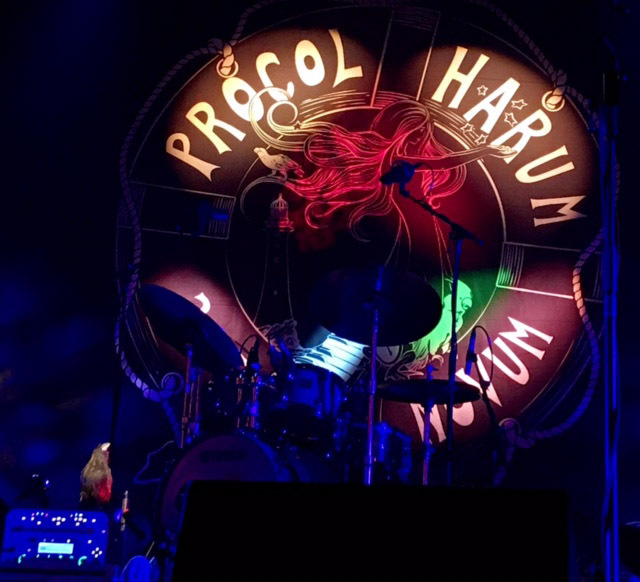 ‘It’s hard to money from a banker … that’s why we rely on the Procol shop.’ At the start the audience clapped along with great fervour. The reggae inflection of verse three was more pronounced again tonight. Apocalyptic lighting! Never heard it done better! The choral voices, coming out of the Montage, seems to say ‘Procol Harum’. A trick of the building, no doubt. Fiery fills from GD … sparkling invention from everybody. ‘Nobody has ever regretted having a Procol Harum album in their house’. GB suggests that nobody in Denmark would like Country music because ‘it’s too windy to ride a horse’. As this song starts up, an immediate strong response of recognition. Another good response. Interesting to hear how the original organ lines are preserved, partly by the organist and partly by the guitar, which played the speedy semi-quavers in verse three. Gary explains the situation of neighbours; pre-song Geoff W mimes the 'wild-loving wife’ and also the ‘sorry sight’ wife. GB explains that English is based on Danish [sic]. The two lead harmony voices sound absolutely great on this charmingly silyl number, and the backing vocals give Queen a good run for their money. At the end GW mimes the infamous pistol-shot (which was excised from the record, leaving only GB’s guttural laughter), but there’s no ricochet sound from the Montage, as we’ve heard at soundcheck. A real highlight of an excellent show: GW sings ‘Hotel Strand’ in the BVs, which cracks GB up in verse two. The lighting man either knows these songs inside out, or has amazing foresight and intuition: the illuminations perfectly complement the narrative of the song.Interesting how GB conducts the band, with his head gestures, so much more when he’s using the faux grand, whose case prevents the rest of the band from seeing his hands. Lovely piano from Gary. Band intros include ‘Henry the Crow’ who is ‘our friend’ and who ‘flew into a soundcheck and has been with us ever since … I think he’s drunk’ Matt introduced as ‘Matt Pegg, looking trim’. Discussion of unusual keys … GB plays the start of Saw the Fire. GB describes this as another ‘meaningful song’. It’s an amazing number … such a stately, slow build, and wind-down afterwards. Interesting how a variant chord has established itself in the final chorus (or rather, a variant bass line to the existing chords). Tremendous applause. Gary Brooker thanks the lighting man, and quite rightly so. Splendid how the guitar solo seems to be entirely different every night. The crowd listens raptly, the applause is protracted and heartfelt. A great show!